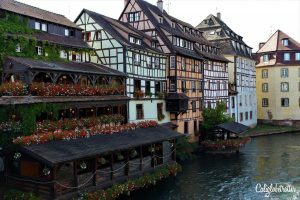 Strasbourg is a medieval city center mixed with a modern day metropolitan city. 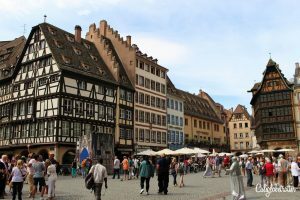 This town has many names it is known by, “Capital of Alsace”, “”Official seat of the European Union” as well as “Home to Europe’s oldest Christmas Market”. 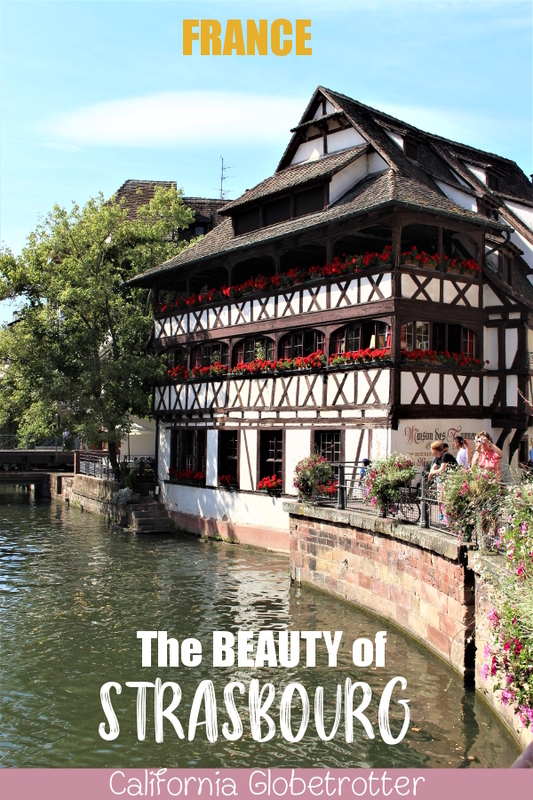 Want to Discover the Beauty of Strasbourg? PIN IT FOR LATER!! 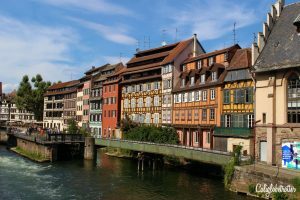 Before you get your Strasbourg sightseeing under way, perhaps you should considering investing in the Strasbourg Pass, saving money while you have a day out on the town or at least breaking even. 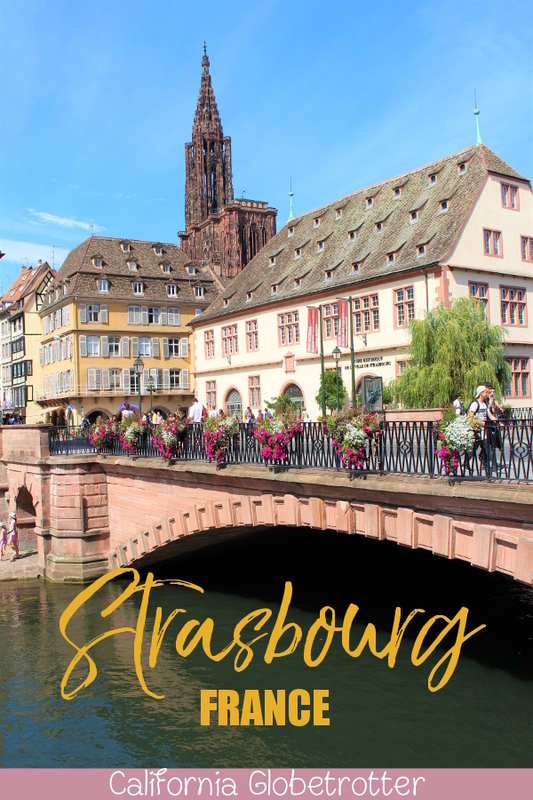 Once you do, you can follow this full Strasbourg itinerary! 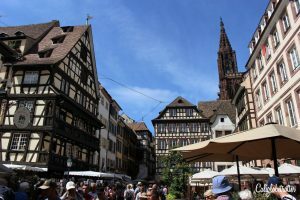 Like Colmar, what draws people here is the beauty of the half-timbered houses that are scattered throughout the entire town, as well as Europe’s sixth largest cathedral, depending on if you speak French: Cathédrale Notre-Dame de Strasbourg or German: Liebfrauenmünster zu Straßburg or more simply, the Strasbourg Cathedral. 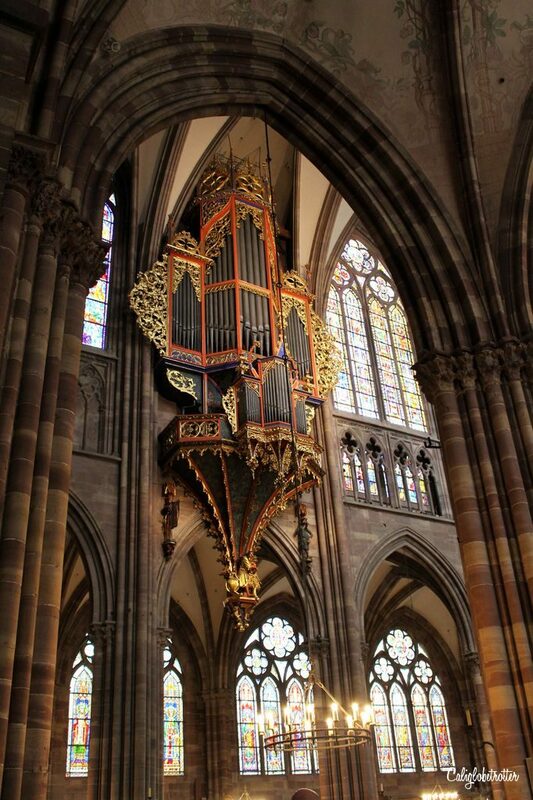 Today, it is one of the finest examples of Gothic architecture and is one of the best sights to see in Strasbourg. I absolutely fell in love with the tall red doors with brass embellishments. 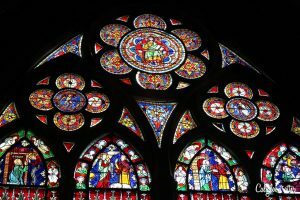 The cathedral laid its first stone in 1015 and would be continuously built on and expanded for the next 400 years. Once the north tower was completed in 1439, it became the world’s tallest cathedral. The cathedral would hold this title for 224 years until 1874 when St. Nikolai’s Church in Hamburg was completed. The south tower would never be built, but the tower is accessible to climb for great views over the city. As it was far too hot on the day we went, we chose not to climb the tower. Supposedly though, you can see all the way to the Black Forest on a clear day! Inside the cathedral remain mostly 14th century stained glass windows, some even dating back to the 12th century with such vibrant colors I was blown away by their beauty. Suspended above the pews on the north side of the nave is the stunning pipe organ that partially dates back to 1290, however, sections of the organ are not older than 1385. One of the most impressive things within the walls of this cathedral is one of the world’s oldest Astronomical Clocks. The clock that is currently in the cathedral dates back to 1838-43, however, there was an even older clock that had previously been in the church which dated back to 1352-54 and is now in a museum. Today, tourists stand in front of or along the wall to admire the clock, but it makes it rather difficult to snap a shot without someone somewhere in the picture! This clock is unusually special as it can compute leap years, equinoxes and much more, making it way more advanced than it’s time. It was able to compute when Easter would fall even before computers were invented! Now that’s impressive! 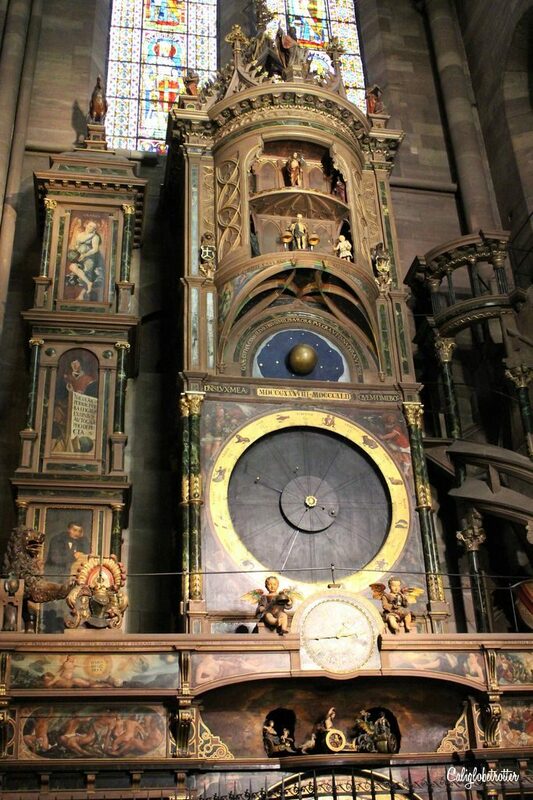 And because this clock was so special, there is a little legend that says that the local authorities of Strasbourg ordered that the conductor of the clock should be blinded so that he could never ever make another clock like it again. Directly in front of the cathedral is a small square with half-timbered houses almost hugging the cathedral, leading down a busy alley with many small cafes and restaurants, some even dating back to 1650s! We were so ravishingly hungry, we plopped down at the nearest restaurant that offered Flammkuchen and had lunch. After lunch, we made our way over to “Petite-France”, the most idyllic part of Strasbourg which you absolutely MUST visit where the Île river splits up into many different canals. 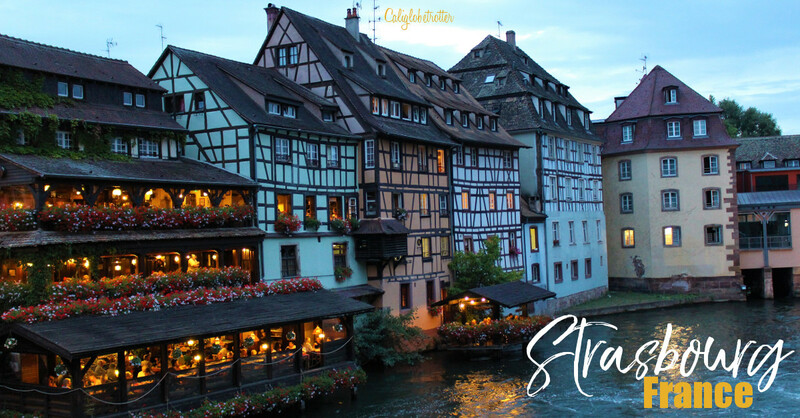 Strasbourg is one of the best canal cities in Europe and it’s clearly evident here in this picturesque quarter of the city! To find this area, we simply walked along the canals leading from the Palais Rohan (next to the cathedral) for about 10 minutes before we came upon Pont des Moulins. From here we crossed over the canal and walked around the entire Petite-France. I suggest walking this way at least to or from Petite-France because it offers some pretty great views of the canal, the houses as well as a glimpse of the cathedral. This area was once where tanning-houses and slaughter houses were and at one point the location of a hospice that was built to house soldiers who had been injured during the Napoleonic Wars. The area didn’t receive the name “Petite-France” for patriotic reasons though, but because of the hospice and many brothels in the area which generated many cases of Syphilis. This area became the worst part of town and people avoided it. In fact, it was so filthy that a church could never be consecrated in this area. The French called it “Napoleon’s Disease” while everyone else called it “France’s Disease” aka Petite France. The Grand Île where Petite-France is located would later become a UNESCO World Heritage site in 1988 as it is one of Strasbourg’s most picturesque districts with half-timbered houses, flowing canals with cafes and restaurants which light up the night. Many of the houses here date back to the 16th and 17th centuries. Our hotel was not far from here and was incredibly adorable with beautiful woodwork and half-timbered framing throughout the hotel. 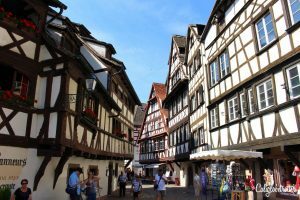 Being a HUGE half-timbered fanatic, I highly recommend staying at the Best Western Europe Strasbourg by Happyculture ⭐⭐⭐ for a comfortable and aesthetically pleasing stay! 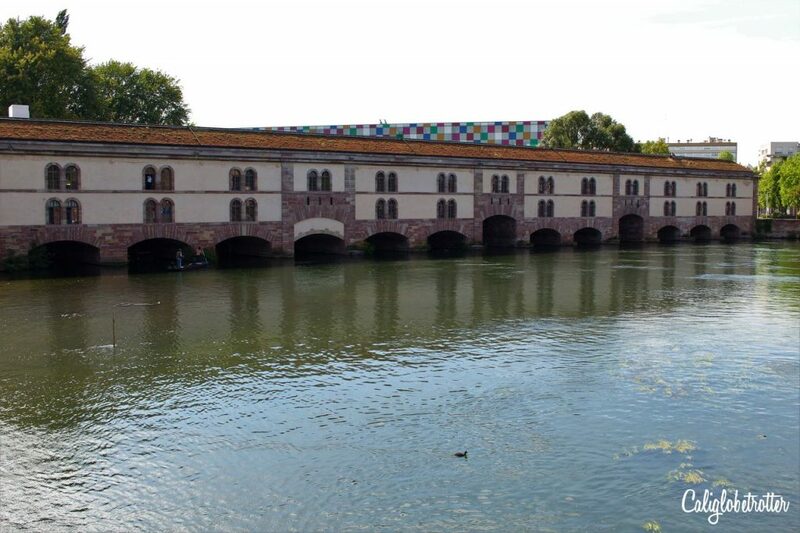 Near here you can also find the Ponts-Couverts (The Covered Bridge), one of the most interesting sights to see in Strasbourg. From the outside it looks rather boring with just a bunch of small arches over the water, but the history is interesting! The city was guarded by four massive towers which were connected to the bridges. The dam was built in 1686 by an architect who felt that the city’s defenses were inadequate. The dam would help prevent attacks coming in from the river and the lower part of the town could be flooded, thus preventing any attacks. Taking a walk inside the covered bridge is great if you’re looking to escape from the heat of the sun, which is filled with different statues, although many lack information as to who they are or where they came from. However, you can walk up the stairs for free to get a great view from the top of the dam over the canals and towers. You can even see the cathedral from here! I couldn’t get enough of this area and we decided to come back in the evening and enjoy it when it was a bit cooler. I’m so glad we did this because it turned out to be incredibly romantic and it felt like walking through a fairy tale. There is just something about dusk and the town lights coming on which transforms a town into a lover’s paradise. While here, it is recommended that you take a boat cruise down the canals as the best way to experience the city. However, with it being so hot on the day we went, we felt that the covered boats would be too hot to enjoy. As much as I love taking boat cruises, sometimes its just better to walk the town and truly see all of it. 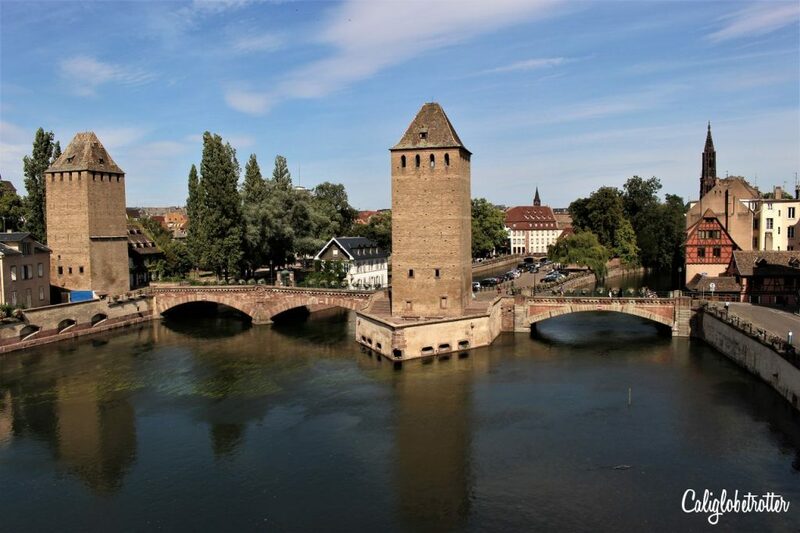 If you’re as much of a history nerd as I am, then you might be interested to know that Johannes Gutenburg was born in Mainz, Germany and he is known for having created the world’s first printing press and is honored in Mainz with the Gutenburg Bible museum, so if you’re looking for great day trips from Frankfurt, Strasbourg is just right over the border! 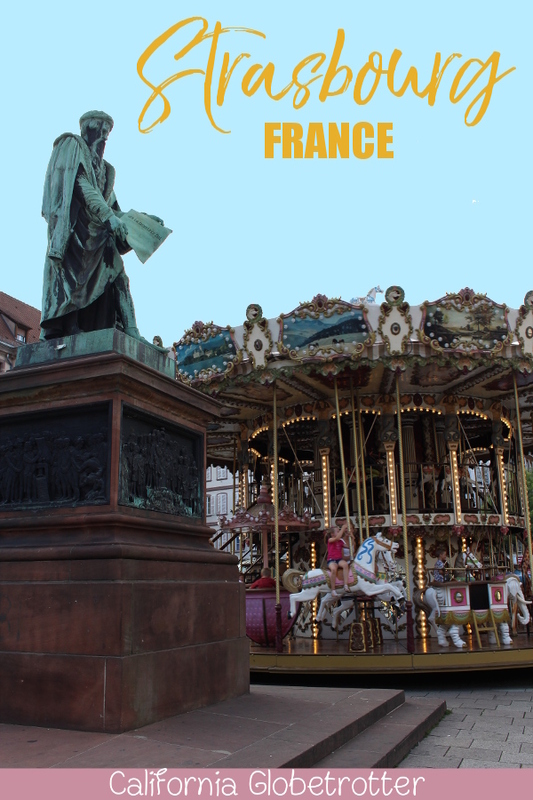 However, it was actually here in Strasbourg that he first attempted printing with movable type, therefore, there is a statue of him in the Place Gutenburg (Gutenburg Square) next to an adorable little carousel. It is thanks to him that printing became more useful than handwriting everything out! The façade of the statue depicts images of the printing press process as well as the signing of the Declaration of Independence. 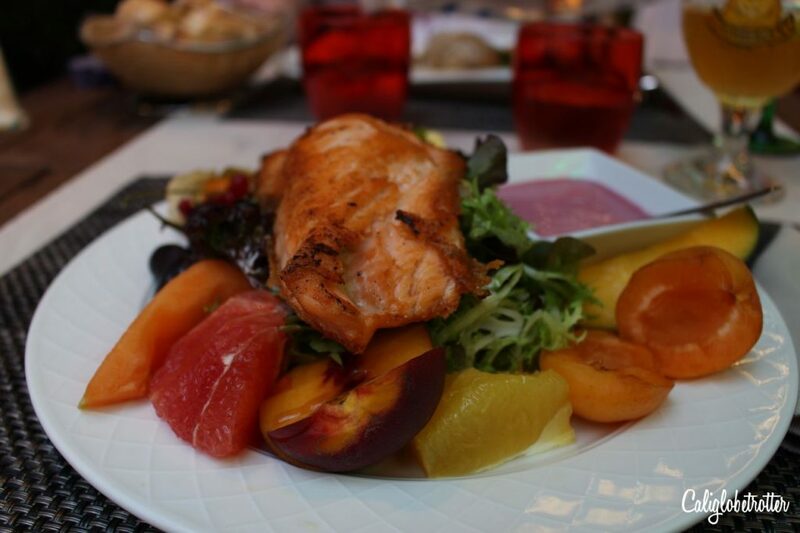 Eat the MOST Delicious Meal Ever at Au Dauphin! 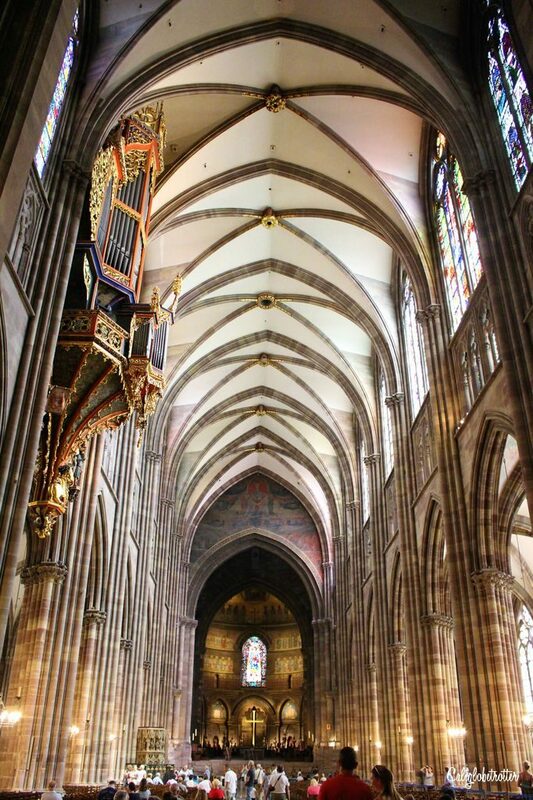 According to TripAdvisor, one of the best places to eat in Strasbourg is a restaurant within a few feet of the cathedral called Au Dauphin. However, it suggested making reservations in advance as this restaurant is very popular. We were roaming around, desperately looking for a restroom as well as somewhere to eat. We saw the restaurant and asked to sit down without realizing this was one of the best restaurants in town. Luckily, because we beat the dinner crowd by going around 5-6pm, we were able to get a table for 2 outsider under the canopy with the tower from the cathedral peaking down on us. I highly suggest eating here as the food was absolutely superb! I have never had chicken that just melted away in your mouth, cooked to perfection. I ordered the Filleted Poultry in a Riesling Wine Sauce with spätzle while Hans ordered the Cordon Bleu Salmon with Seasonal Fruits. Catch a Light Show on the Cathedral…if you can! 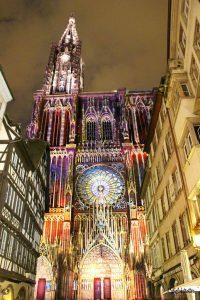 As we had been walking around earlier in the day, much to our delight, we had discovered that Strasbourg was putting on a light show throughout the entire summer to celebrate 1000 years of the cathedral’s history from 1015-2015. It would start at 10:15pm and there would be a light show with cool displays on the side of the cathedral which lasted about 15 minutes, while on the front of the cathedral was just a projection of colors. If you’re interested in visiting France and are looking for more information, I highly recommend using the DK Eyewitness Travel Guide or the Lonely Plant Travel Guide! Without these guides, I would be lost! These are my travel Bibles! 12 bloggers like this on caliglobetrotter.wordpress.com! Me too! Paris is just too crowded and overrated. Strasbourg was clean and romantic! Such a beautiful place! I just came form there and there’s no place like it! Great photos! Its definitely worth the visit and Christmas Market season is just around the corner! Could hit two birds with one stone, as the Christmas Market here is beeeeautiful! Seriously though, the photos are BEAUTIFUL! I love it!! Good to know! I always think I put too many pictures in and when I look at other blogs they don’t have enough pictures! I like to really give a good feeling, as if they are on the trip with me! I’ve always heard amazing things of this place. It is so beautiful! holy toledo! your pics are stunning! pinning this right now! Thank you! Thanks for stopping by and sharing the love! If you ever get the chance, the Christmas Market is absolutely beautiful! A friend of mine went last year when we both lived in Lyon and she absolutely RAVED about it! She bought the most beautiful gifts and keepsakes. Oh how interesting to do a bike ride through that region! Yes you definitely need to visit! 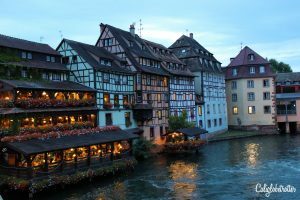 We spent 10 days in Strasbourg around Christmas in 2015. It really was a fairytale, magical place. Thank you for evoking so many happy memories. 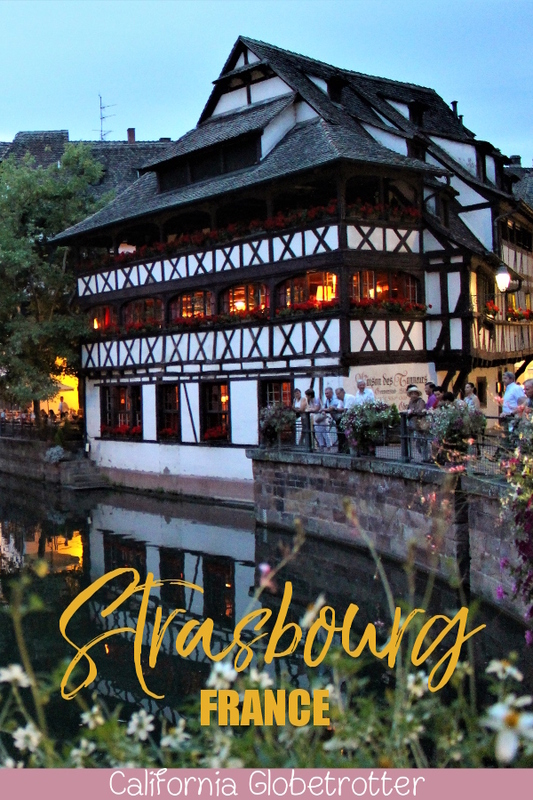 I actually had no idea Strasbourg was so beautiful – I admit I was very ignorant about it. How many stripey, gorgeous half-timbered, chocolate-box houses can you fit in one town – I adore it! Thanks for the tip-off, I’m now dying to go. 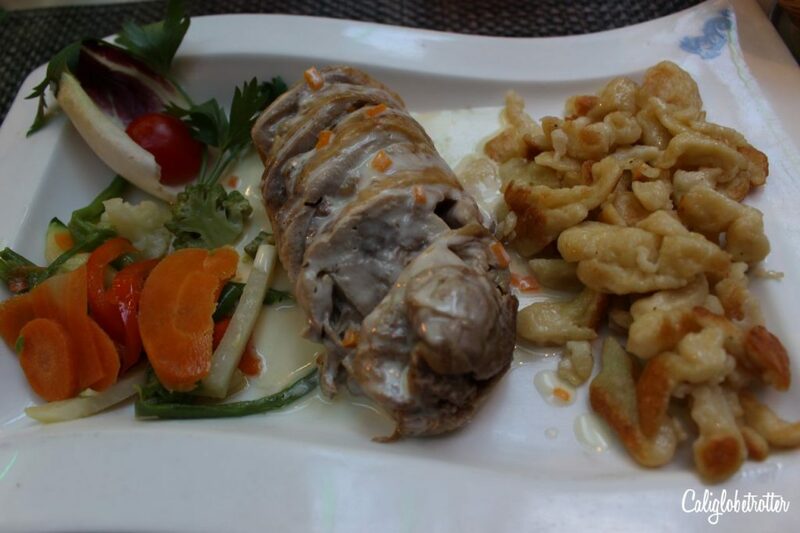 Hmm spätzle… love ’em. Oh you’d love it!! Be sure to check out my Christmas Market post for Strasbourg as well because it’s EVEN MORE beautiful then, as if such a thing was possible! They couldn’t be more right! You gotta get going! The Christmas Market is also amazing! I have a post for that too! Is there anywhere in Europe you haven’t been? Seriously! You make everywhere look absolutely gorgeous. Oh, it all looks like the setting from a fairy tale! Strasbourg is amazing!! You should definitely go! Yes! I’ve also seen pictures of the Lyon Cathedral lit up! I’d love to see that! My husband and I are planning out a 10-day trip, flying into Paris and traveling from there. 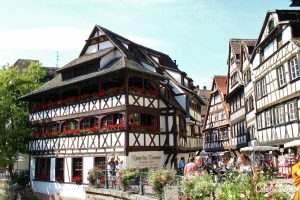 Would you recommend staying 2-3 nights in Strasbourg or Colmar if we had to choose one? They seem super similar and seems close enough we could train to the other if we want. Ya I would easily stay in one or the other for 2-3 nights in Strasbourg if you want to make that your home base.